Elias G. Bellos is a journalist. Over the past years he has been working for the Kathimerini newspaper, while in the past he also worked for the Kefalaio newspaper, capital.gr as well as for a number of other mass media. He has been a Publishing Consultant for the “Isotimia” weekly financial newspaper and Editor in Chief isotimia.gr and Banker’s Review; financial conference producer for Boussias Communications; while between 2007 and 2011 he served as Managing Director for the Daily Press Group New Media. 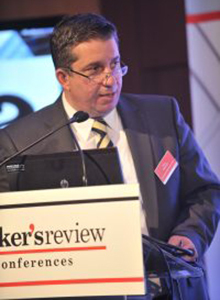 He has also been Director of International Relations for the Nemesis and ADELE SA groups (Development of Business Week and Bloomberg branded content & syndication projects, Paragraph Publishing joint venture, McGraw-Hill venture); while, during his 25 years in the media, he published the Greek Business Review and Whisky Magazine. At the same time, he worked with a number of other printed and electronic Press news media. As for television, he has worked as the main presenter of the daily live show «Markets Time» and as editor and presenter for the 9,84 and Planet radio stations. His portfolio also includes experience in Mass Media Development, Promotion, Communication and Commercialisation, as well as research, since he participated in the drafting of studies and special publications for the Hellenic Centre for European Studies. He holds a Master’s degree on the Theory & Philosophy of International Relations & Conflict Resolution from the University of Kent at Canterbury and a degree in International and European Studies from National and Kapodistrian University of Athens. He is married and has two children.